I recently turned another year older and was delighted to hear of another celebrant in town. Nosh and Quaff Restaurant celebrated its 1st year, by throwing a massive birthday bash which happened to coincide with my birthday September 15th (why thank you)! The night was filled with live music, drinks and lots of food. Nosh and Quaff are known for doing things big, bold and messy and the night did not disappoint on that front. Their signature hashtag #LetsGetMessy was encouraged on the evening. When I first moved up to Birmingham, it was one of the first places that kept propping up on my Twitter feed and in restaurant discussions. Those in the know kept recommending the cool little brother of The Lasan Group. 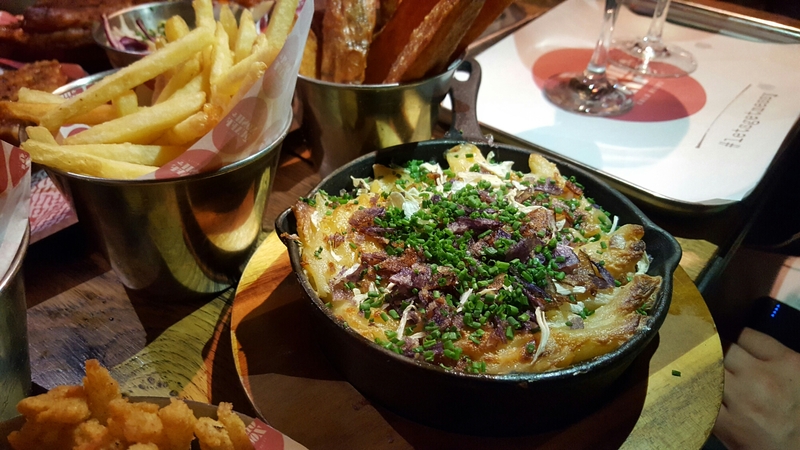 Run by Jabbar Khan and chef Aktar Islam, the group also owns Lasan, Fiesta del Asado and Raja Monkey. I’m really keen to try the latter two, especially with Fiesta del Asado located in my local neighbourhood in Edgbaston. Nosh and Quaff is located in a beautiful grade II listed building, overlooking the Town Hall in Victoria Square. A prime location on the corner of Colmore Row and Waterloo Street, it’s set over 3 floors with high ceilings and large windows letting in lots of natural light. I’m honestly not the sort of person that obsesses over light fixtures in a bar or restaurant, however Nosh and Quaff pay particular attention to detail by way of lights and fixtures. I really liked the interior and it showed that time and effort was put into this and not just an after thought. It was lovely to see many original features blending so effortlessly with modern touches. We started off with a Bellini take on the Pornstar Martini. I’d never heard of, let alone had a Pornstar Bellini. It was filled with passion fruit, vodka, pasoa and topped with sparkling wine. It’s always a great idea to start a birthday celebration with a glass or 2 of fizz! A couple of glasses didn’t feel overly sweet or sickly. The fizz balanced out the other ingredients. The upstairs dining room was buzzing.Whilst guests enjoyed their welcome drinks, canapés were served. I only had a lobster bite, it was quite nice with a decent bit of meat, however it was a bit oily. I shared a table with Vicky O from Brumderland and her husband, and our mutual friend Lou. 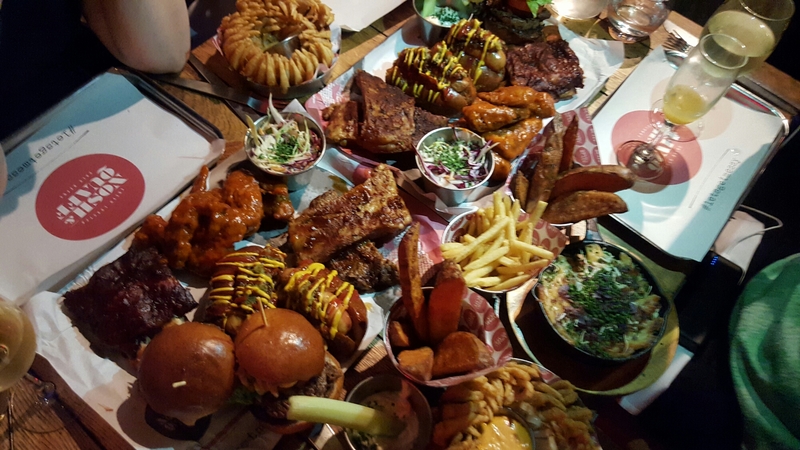 The food was served in abundance, with plenty of exciting dishes to try. It was really nice to sample a bit of everything and trying things that I would not normally order. 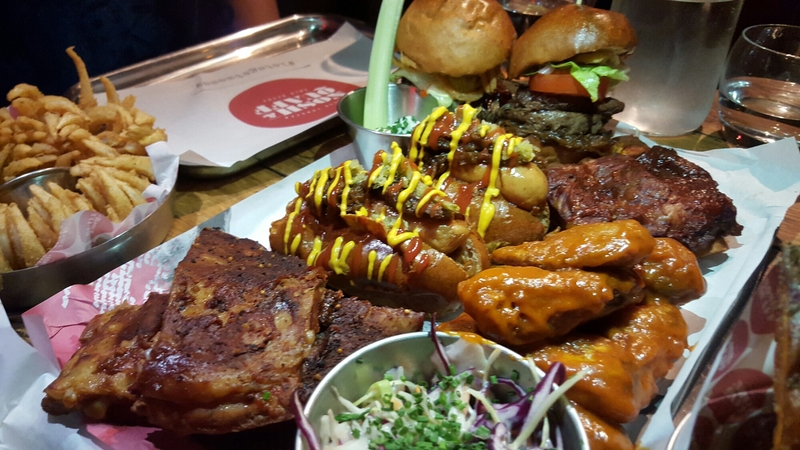 Expect to find on the menu, hot-dogs, burgers, sweet potato fries, ribs and chicken wings. 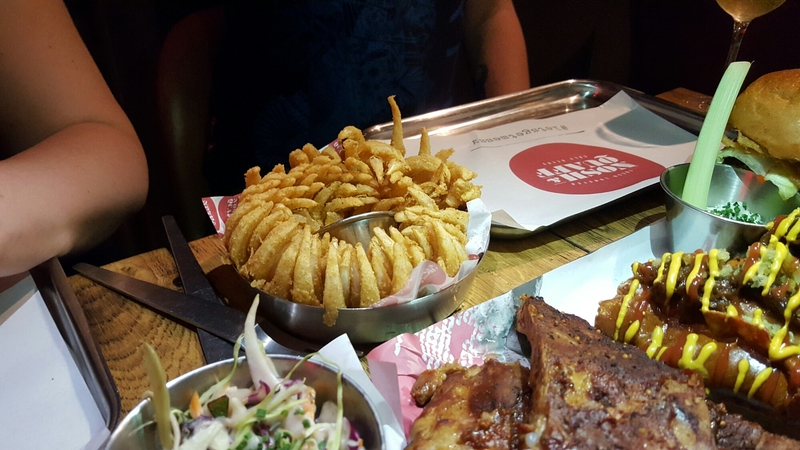 They even had a bloomin onion – like an onion ring, but with the whole onion! The burger meat was succulent and juicy, made with dry aged beef and topped with a delicious creamy sauce. I was very very very pleased with the wine on offer ! It was lovely to see Kung Fu Girl Riesling and Boom Boom Syrah being served by the glass. Both are produced by Charles Smith of Washington State, USA and distributed by Bibendum Wines. The Riesling was smooth and aromatic, medium bodied with a slight oily residue finished with citrus. A complimentary match to the lobster. The Boom Boom was a Syrah Mouvedre blend, ever so chocolaty, with hints of tobacco, spice and dark fruit – a perfect match for the juicy ribs or burger. For beer lovers they had a few beers on draught including Brooklyn Lager. The evening was finished off with Espresso Shooters – Kahlua, vanilla, vodka and coffee. And if you don’t feel like leaving, there are lots of little spots that feel like a prison…if that’s what you are into. If prisons serve this kind of food, I’m ready for my sentence. tings in a gorgeous grade II listed building! The entire evening was complimentary. Thank you Lasan Group for extending the invitation.